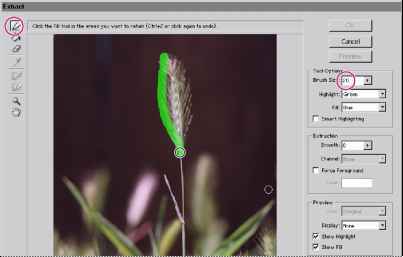 Now you'll work with another masking and selection tool, the Extract command, to make some difficult selections—some marsh grasses and a foxtail. 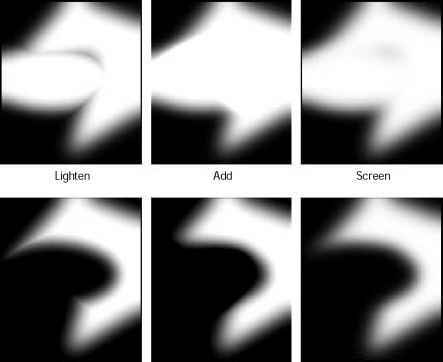 The Extract command provides a sophisticated way to isolate a foreground object from its background. Even objects with wispy, intricate, or undefinable edges can be clipped from their backgrounds with a minimum of manual work. You'll start with an image that consists of only one layer. You must be working in a layer to use the Extract command. If your original image has no layers (that is, has only a Background), you can duplicate the image to a new layer. You'll use the Extract command on a foxtail image set against a dark background. 1 Choose File > Open, and open the file Foxtail.psd from the Lessons/Lesson06 folder. The Foxtail grass image has the same resolution as the Egret image, 72 pixels per inch (ppi). To avoid unexpected results when combining elements from other files, you must either use files with the same image resolution or compensate for differing resolutions. For example, if your original image is 72 ppi and you add an element from a 144-ppi image, the additional element will appear twice as large because it contains twice the number of pixels. For complete information on differing resolutions, see "About image size and resolution" in Adobe Photoshop7.0 online Help. The Extract dialog box appears with the edge highlighter tool ) selected in the upper left area of the dialog box. To extract an object, you use the Extract dialog box to highlight the edges of the object. Then you define the object's interior and preview the extraction. You can refine and preview the extraction as many times as you wish. Applying the extraction erases the background area to transparency, leaving just the extracted object. If needed, you can resize the dialog box by dragging its bottom right corner. You specify which part of the image to extract by using the tools and previews in this dialog box. Now you'll choose a brush size for the edge highlighter tool. You'll start with a fairly large brush. 3 If necessary, enter 20 in the Brush Size text box. It's easiest to start with a large brush to highlight the general selection, and then switch to a finer brush to fine-tune the selection. 4 Using the edge highlighter tool, drag over the fuzzy ends and tip of the foxtail until you've completely outlined, but not filled, the foxtail. Draw the highlight so that it slightly overlaps both the foreground and background regions around the edge. It's OK if the highlight overlaps the edge. The Extract command makes its selection by finding the difference in contrast between pixels. The foxtail has a well-defined interior, so make sure that the highlight forms a complete outline. You do not need to highlight areas where the object touches the image boundaries. Now you'll highlight the fine stem. 5 Decrease the Brush Size to 5. 6 If desired, select the zoom tool ( 0, or press spacebar+Ctrl (Windows) or spacebar+Command (Mac OS) and click to zoom in on the stem. You can also use the hand tool ( ) to reposition the image preview. 7 Using the edge highlighter tool, drag over the stem to select it. If you make a mistake and highlight more than desired, select the eraser tool -) in the dialog box and drag over the highlight in the preview. 8 Select the fill tool in the Extract dialog box. Then, click inside the object to fill its interior. You must define the object's interior before you can preview the extraction. The default Fill color (bright blue) contrasts well with the highlight color (green). You can change either color if you need more contrast with the image colors, using the Highlight and Fill menus in the Extract dialog box. • To magnify the preview, select the zoom tool ( 0 in the Extract dialog box, and click in the preview. To zoom out, hold down Alt (Windows) or Option (Mac OS), and click with the zoom tool in the preview. • To view a different part of the preview, select the hand tool ( ) in the Extract dialog box and drag the image in the preview. To toggle quickly between the edge highlighter and eraser tools when one of the tools is selected, press B (edge highlighter) or E (eraser). • Switch between the Original and Extracted views using the Show menu in the Extract dialog box. • Click a filled area with the fill tool to remove the fill. • Select the eraser tool ( ) in the Extract dialog box, and drag to remove any undesired highlighting. • Select the Show Highlight and Show Fill options in the Extract dialog box to view the highlight and fill colors; deselect the options to hide them. • Zoom in on your selection using the zoom tool in the Extract dialog box. You can then use a smaller brush size as you edit, switching between the edge highlighter tool and the eraser tool as needed for more precise work. • Switch to a smaller brush by entering a different size in the Brush Size text box and continue to refine the selection's border using the edge highlighter or to erase using the eraser tool. 11 When you are satisfied with your selection, click OK to apply the extraction.